This article explains the step-by-step tutorial to set up ELEX Bulk Edit Products, Prices & Attribute for WooCommerce. For more information on the plugin, refer the product page. If you have a large number of products, it becomes difficult to edit, update or even manage those products. For example, if you have products with lots of variations, it is a tough job to update all the attributes and variations to the products. Hence you need a solution (or plugin in WordPress terminology) that saves you time and trouble. The ELEX Bulk Edit Products, Prices & Attributes for WooCommerce is just the right plugin for the job. How to Undo the Last Update? Product Filters: The plugin provides filters to bulk edit products by product title, product types, product categories (optional sub-categories), global product attributes, and product regular price(s). Undo Update: You can revert the update back to its initial state with just a single click. Enable this setting to be able to undo settings update. Product type: The plugin supports Simple and Variable products (parent and variations) for bulk edit. User Role based Bulk editing: You can bulk edit prices based on user roles using the ELEX WooCommerce Catalog Mode, Wholesale & Role Based Pricing plugin along with ELEX Bulk Edit Products, Prices & Attributes for WooCommerce plugin. All the above features (and many more!) are bundled to serve you to bulk edit WooCommerce products on your store. WordPress Dashboard > WooCommerce > Bulk Edit Products. WordPress Dashboard > Plugins > Installed Plugins > ELEX Bulk Edit Products, Prices & Attributes for WooCommerce > Bulk Edit Products. The bulk edit process comprises of 4 simple stages, as explained below. The first step is to filter the products that you want to edit in bulk. The plugin provides the following filters to do the job. Product Title: Allows you to filter products with the product titles that Starts with, Ends with or Contains the text expression. You can also filter using Regular Expression match. The syntax for regular expression match is [regularexpression]. For example, if you have to search for product titles containing numbers, then your search pattern should be [0-9]. Read the PHP Regular Replace Manual for more patterns and their syntax. Product Type: You can select from Simple, Variable (Parent) or Variable (Variation) product types for filtering. 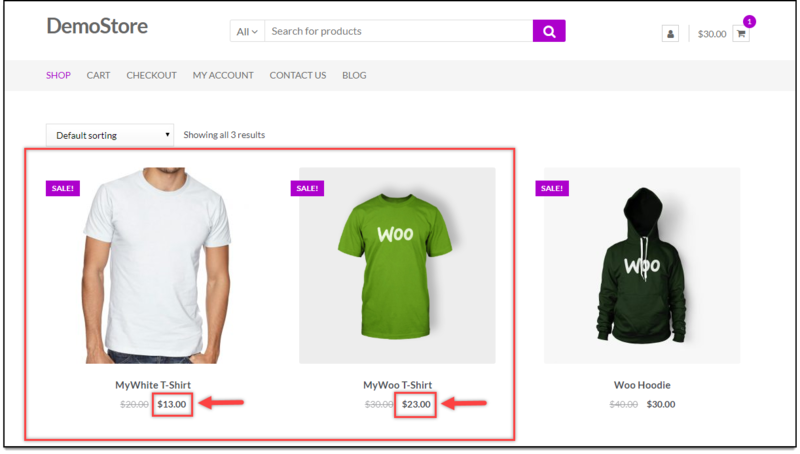 Product Categories: Select the desired product categories that you have created in your WooCommerce store. Additionally, you can tick the Include Subcategories option to include sub-categories of the selected product categories. All – Includes all products. >= – Includes products with value, greater than or equal to the entered price. <= – Includes products with value, lesser than or equal to the entered price. == – Includes products with the value exactly equal to the entered price. || Between – Enter the minimum and maximum regular price value to filter the products. 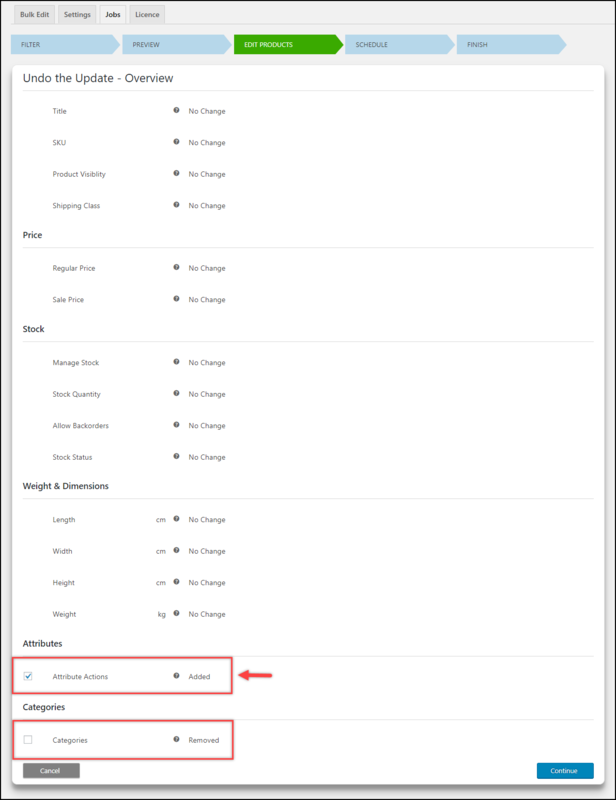 Product Attributes: If you have created global attributes in your WooCommerce Attributes settings, they will be shown in this setting. You can use global product attributes to filter the products for editing. Once you have selected an attribute, you can select the desired Product Attribute Values for deeper filtering. You can group the attributes in OR and AND operations. The OR grouping with filter products that have either of the selected attribute & attribute values, whereas the AND grouping will filter products that have all the selected attribute & attribute values. Remember, only the global product attributes (if created) will be displayed in this setting. If no global attributes are created, this setting will not show any options. Exclusions: Tick this checkbox to reveal further settings. You can exclude certain products from the filtered products, by specific their product IDs or selecting a specific category itself. Once the above filters are configured, click on Preview Filtered Products button. The preview stage is necessary to examine whether the filtered products are the ones to be edited. If you are not satisfied with the filtered result, you can click on the Back button, to go back and apply new filters. Else, click Continue to proceed to the next step. In this panel, you can update several properties of the products filtered in the previous steps. Set New – Set a new product title for the products. Append – Add custom text at the end of the existing product title. Prepend – Add custom text at the beginning of the existing product title. Replace – Replace certain words or full product title with the entered text. RegEx Replace – Replace the entered regular expression pattern with the entered replacement value. More on the regular expression pattern in the respective PHP manual. For example, I’ll prepend the text “My ” to the title of all the T-Shirts. Here’s what it will result in after I click Update Products. Set New – Set a new product SKU for the products. Append – Add custom value at the end of the existing product SKU. Prepend – Add custom value at the beginning of the existing product SKU. Replace – Replace certain words or full product SKU with the entered value. RegEx Replace – Replace the entered regular expression pattern with the entered replacement value. For example, I’ll replace the letter “A” in the product SKU “A201” to “B”. This will result in product SKU value as “B201”. Product Visibility: Select from the following visibility options for the filtered products, on the Catalog/Search page. Shop and Search – Filtered products will be available in both the shop page and store’s search results. Shop – Available only on the shop page. Search – Available only in the store’s search results. Hidden – Filtered products will be hidden from the shop completely. For example, I’ll change the visibility of all the T-Shirts to Shop only. The below screenshot shows the product is visible in Shop page. But when I search for the product in the search bar, the product is not found, as shown in the screenshot below. Shipping Class: Select the desired shipping class for the filtered products. If a shipping class is already assigned to a product, it will be replaced. Remember, if you have not created any Shipping class in your WooCommerce setting, no value will be shown in this dropdown list. For example, I’ll apply the T-Shirt Class to the filtered T-Shirt products. The result will be as shown in the screenshot below. For example, I’ll apply a flat price of $20 for all the T-Shirts in my store. The updated regular price for all T-Shirts is shown in the screenshot below. For example, I’ll increase the Sale price of the T-Shirts by $3. The updated sale price is as shown in the below screenshot. For the range values (increase and decrease) you can choose to round up, round down or apply no rounding at all. Manage Stock: You can choose to enable or disable stock management for all the filtered products and variations. Stock Quantity: You can bulk update the stock by either increasing, decreasing or replacing the stock value. For example, I’ll increase the stock quantity of T-Shirts to 20. The updated stock quantity is as shown in the below screenshot. Stock Status: Update the stock status for the filtered products as In stock, Out of stock, or On Backorder. For example, I’ll update the stock status of all my T-Shirt products to Out of Stock. Here’s how the stock status will be updated. Length/Width/Height: You can add, subtract or replace the existing length/width/height of the filtered products in bulk. For example, I’ll replace the existing length of all my T-Shirt products to 24 inches. The updated length size of T-Shirts will be as shown in the below screenshot. Weight: Add, subtract or replace the existing weight of the filtered products in bulk. If you have created custom global attributes, you can add, remove or replace them with the existing ones to all the filtered products in bulk. Attribute Action – Select desired action from Add. Remove or Replace to make changes. Attributes – Once an action is selected in the previous setting, global product attributes will be shown here. Tick the desired attribute checkbox to apply changes. Product Attributes Values – The values of the respective attributes chosen in the previous setting is listed in this setting. For example, if you have an attribute called ‘Color’, then its values can be different colors like red, blue, yellow, green and so on. This setting helps in choosing only a specific attribute value for adding, removing or replacing values to all the filtered products. 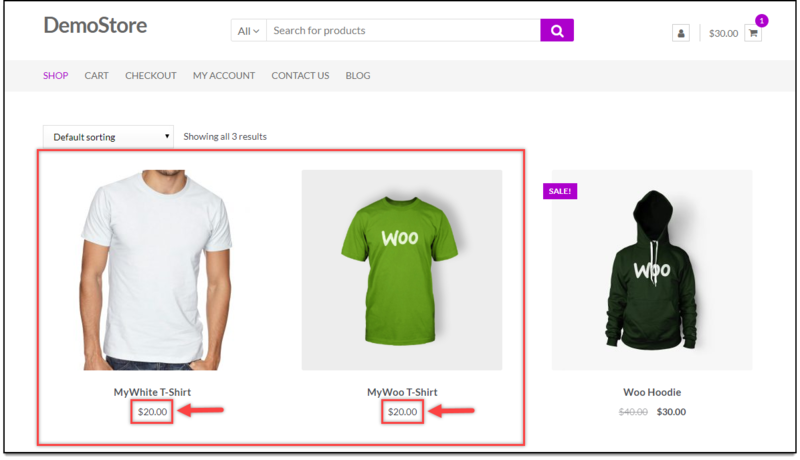 New Attributes Values – If you wish to add new attribute values for your products, you do not need to go to your WooCommerce Attributes settings. However, if you need to add a new Product attribute, you should use the default WooCommerce Attributes settings. With this setting, you can add or replace new attribute values. You can add or replace multiple values by entering one value in each row. Used for Variation – You can choose to enable or disable whether the newly added attributes should be used for variation or not. 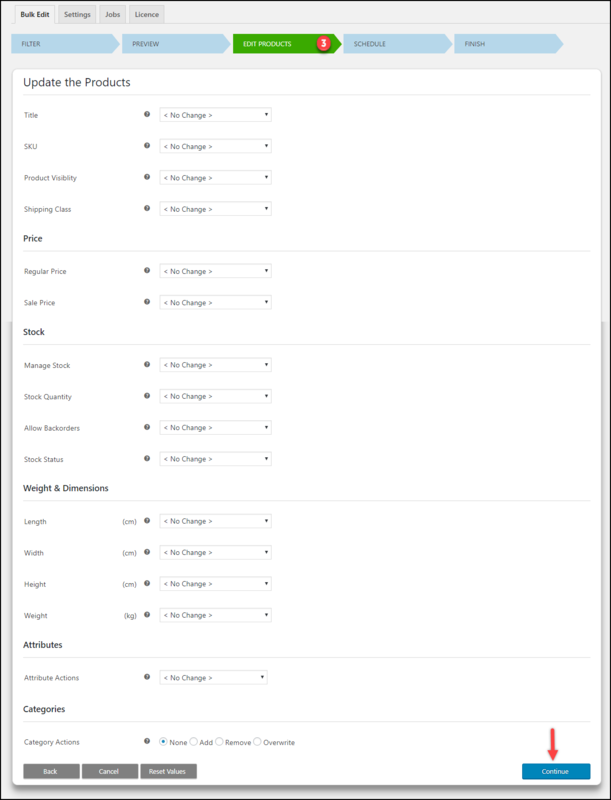 For example, I’ll add the new product attribute ”Size” (which I created in WooCommerce Attributes settings) to all my products. In addition to this, I’ll create new Size attributes values like Small, Medium, and Large, and apply the same, and use the same attributes for variation purpose as well. 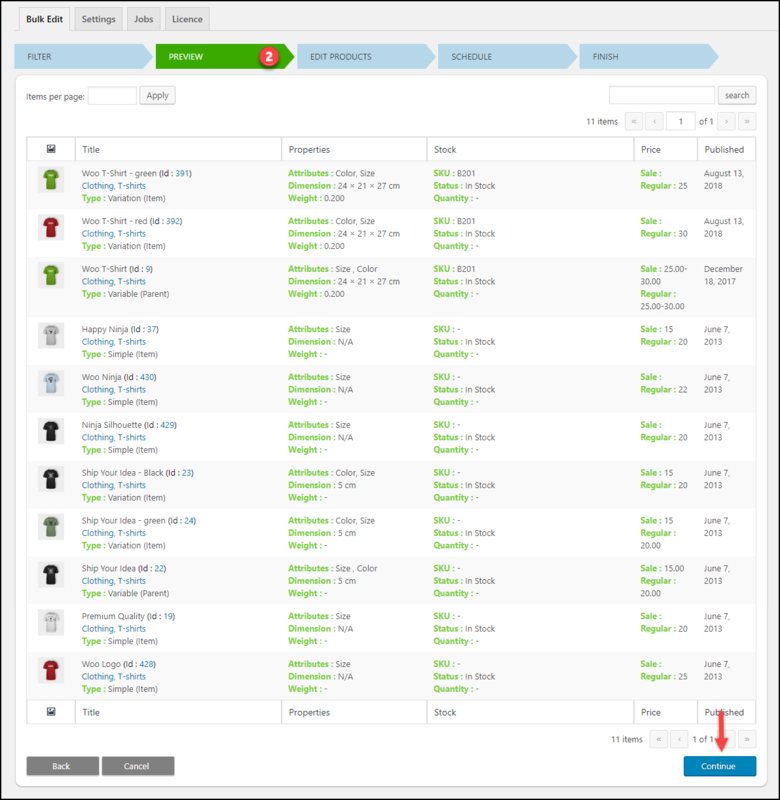 The updated product page with new attributes will be as shown in the screenshot below. You can bulk update your existing product categories for the filtered products. 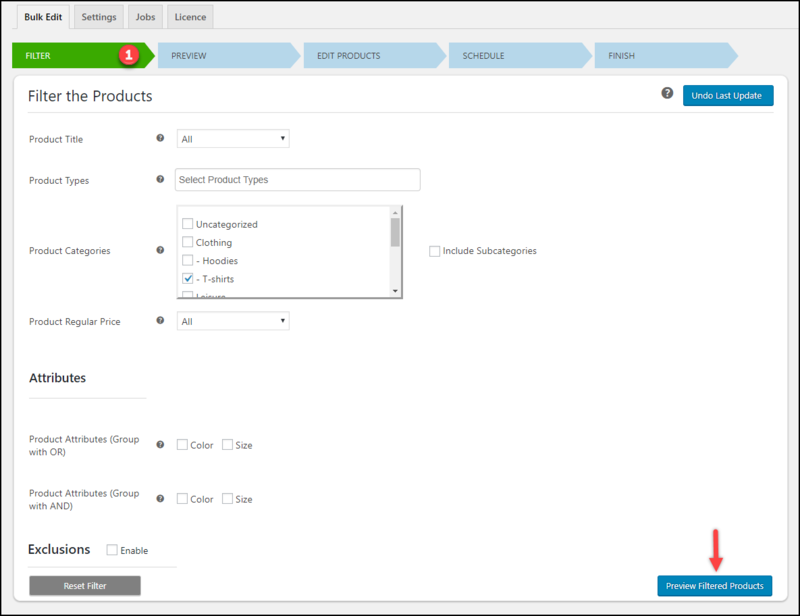 You can choose to add an existing product category, remove a category, or overwrite the selected category to the filtered products. For example, we have removed the Clothing category from T-Shirts products. Below is a screenshot which shows only T-Shirt category shown in the product, after removing the Clothing category. Once all your settings are configured, click Continue. The schedule settings allow you to apply the bulk update operation at a scheduled time. You can also save the job for future use. In addition to this, you can even choose to revert back the changes immediately or at a scheduled time. 1. Perform the Bulk Edit Now – Allows you to bulk update products immediately. You can choose to save it as a job y ticking the respective checkbox next to the Actions settings. This will save the settings as a separate job, allowing you to use or manage it in the future. 2. 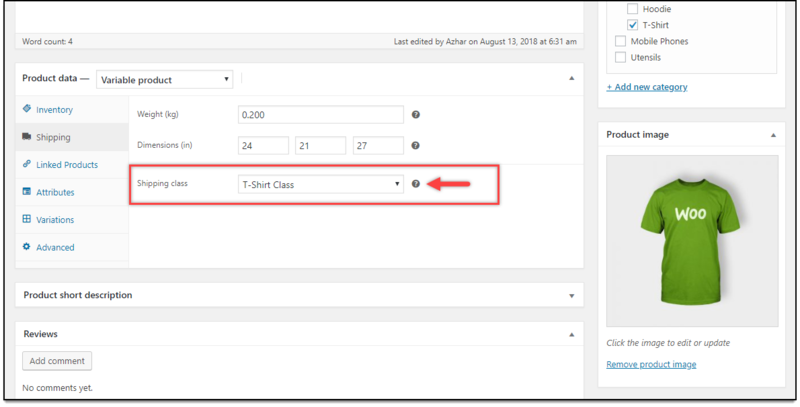 Schedule it for later: You can choose to perform the bulk edit operation at a scheduled time. You can specify the date and time for the bulk update operation. Also, you can revert back the changes at a specified date and time. 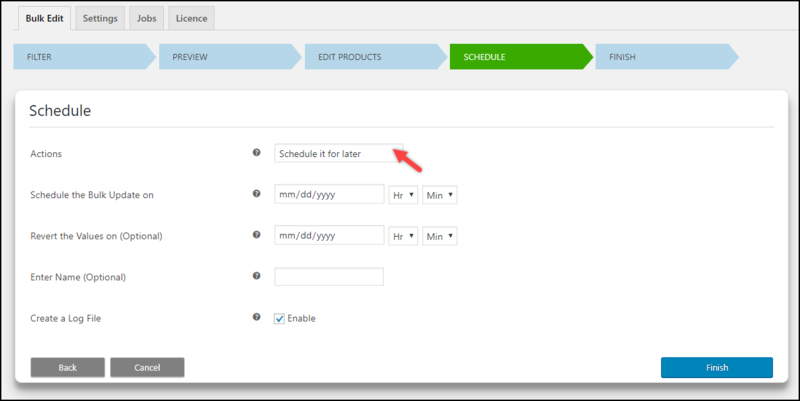 This feature is helpful when you want to apply bulk changes to products for only a specific time period. Enter Name (Optional): Enter a suitable name to identify the jobs. By default, jobs will start from “job_1”. Create a Log File: Tick this setting to create a log file of the settings. The log file will contain information related to all the product fields that are updated. This lof file can be downloaded from the Jobs dashboard. Click Finish to proceed with the update. Once all your filtered products are updated, you’ll see a success message indicating that all the products are updated. Just like WooCommerce product fields, you can also bulk update custom meta fields from third-party plugins like ELEX WooCommerce Catalog mode plugin, ELEX DHL Shipping plugin, ELEX EasyPost Shipping plugin, ELEX Australia Post Shipping plugin, and so on. For example, to update a meta-field called Tariff code for ELEX Australia Post Shipping plugin, you need to enter the meta key of the equivalent meta-field in this text field. You can enter multiple meta-keys by separating them with commas. Once you save this setting, this field will appear at the end in the Bulk Edit operation settings, as shown in the screenshot below. In this tab, you can view all your saved jobs. You can perform quick actions like editing or copying the job, performing a quick bulk update, reverting back the last update of respective task, delete or cancel the task, or download the log file. A screenshot with sample scheduled tasks is shown below. If you are not happy with the last update to your products, you can revert back the changes easily. To revert back a specific job, go to the Jobs tab and click on the Revert icon in the respective task to revert back. Remember, you can only undo the last update if you had updated the products with the checkbox being enabled. To undo the last update, go to the first screen used for filtering the products and click on Undo Last Update button, as shown in the below screenshot. In the next step, you’ll be shown all the changes that you have made in your last update. If you have made multiple updates, tick the respective checkbox of the setting you want to revert back to its previous state. In the below screenshot, my last update was applying a new attribute ‘Size’ to all the filtered products and removing Clothing category. Click Continue and confirm your action to proceed further. If the undo operation is successful, you will see a pop-up window showing the success message, as shown in the screenshot below. The ‘Size’ attribute will no longer be available for the products. To explore more details about the plugin, go check out ELEX Bulk Edit Products, Prices & Attributes for WooCommerce.